An A-Z of alphabet excitement! Cute animals prance and play, sandcastles are built, and clothes dry on a line. 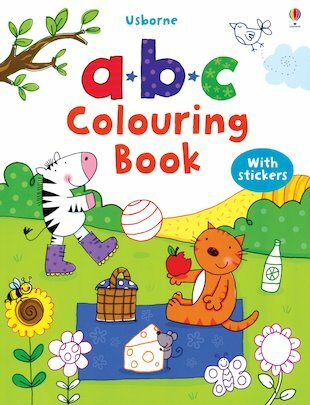 Colour in objects, stick in bright stickers and add alphabet letters to complete each picture scene! Full of everyday scenes and objects brought to life by energetic, cuddly artwork, this is a gorgeous little book for any tot who is starting to learn letters. Diggers, lions, kites, rockets and robots zap fun into the alphabet, while you can choose whether to start by sticking in colourful picture stickers – or big letters of the whole alphabet!